Brad Ross has been a forensic odontologist since 2010. Under the law, certain deaths in Queensland must be reported to a Coroner. These include unnatural deaths, homicides, and cases where the cause of death or identity of the deceased person are unknown. The Coroner then starts an investigation to find out what has happened. As a forensic dentist, Brad Ross from Forensic and Scientific Services assists in these investigations. We interviewed him to find out what his role involves. What does a forensic dentist do? How can people be identified by their teeth? Is it anything like CSI? Read on to find out. Technically, Brad says, the name of the specialty is ‘Forensic Odontology’, though the term forensic dentist is more easily recognised by most people. After studying dentistry, dentists can take further speciality training in forensic odontology, learning skills in anatomy, pathology and relevant law as well as assessing dental records, analysing post-mortem scans, assisting in autopsies and recognising signs of trauma. Employed by Queensland Health and reporting to the Chief Forensic Pathologist, a small team of forensic odontologists works closely with forensic pathologists, coroners and police, typically on a part-time basis. Forensic odontologists must also be registered dentists, with their main employment as university professors, other dental specialties, or dentists in the armed forces or in community clinics, who together bringing a breadth of knowledge and experience to forensic odontology. Brad has been part of the team since 2010, and while he acknowledges that the job isn’t for everyone, he says he finds fulfilment in a job that helps people in a very difficult time of their lives. What does a ‘day in the life’ of a forensic dentist look like? Brad’s day starts at about 7:50am, when he meets with police or pathologists to discuss what cases need dental identification. The team’s caseload can vary a lot, with anywhere up to three cases on an average day. If there’s a new case, Brad’s work starts with investigation, tracking down the dental records of the missing person to compare them to the dental features of the deceased person. Brad would also complete reports and statements for court, whether confirming an identity or demonstrating that dental identification isn’t possible. Reports must be written meticulously and are always double-checked by at least one other team member. Some identifications are done out of hours. In homicides, for example, police need to confirm the identity of the victim before they can proceed with the investigation. Brad may have to give expert testimony in court cases where his reports are used as evidence about identification or dental injuries. Detailed contemporary records and reports are therefore vital. How does dental identification work? Brad explains that if a deceased person cannot be identified by a relative or friend, identification may have to rely on fingerprints, DNA or teeth. Use of these “primary identifiers” typically becomes necessary if the deceased person’s face cannot be recognised easily, for example due to severe burns or injury. However, these methods depend on finding records made during life, such as dental X-rays or other records. This may be less confronting for the family – and more reliable – than attempting visual identification. 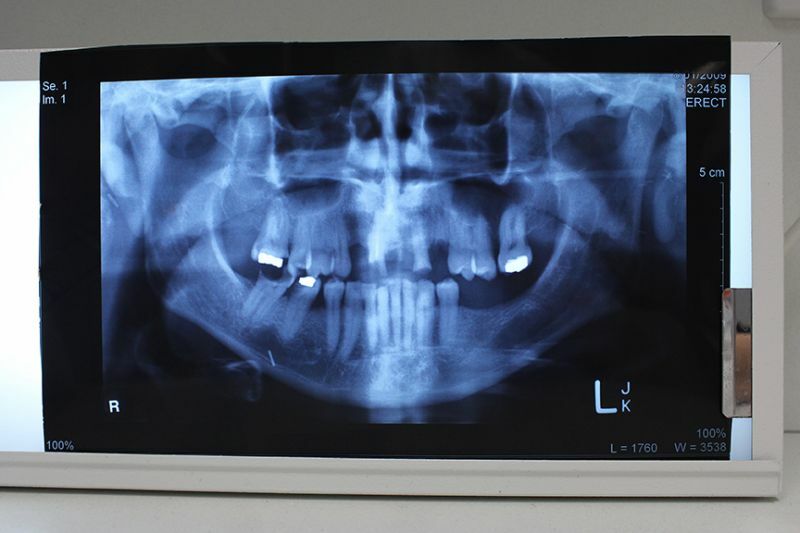 Dental identification is done by comparing a deceased person’s teeth and jaws with the missing person’s dental records, using X-rays or computed tomography (CT) scans where possible. Comparison of digital images of this sort provides a powerful tool for identification. As Brad says, ‘a picture is worth a thousand words’, when it comes to teeth. 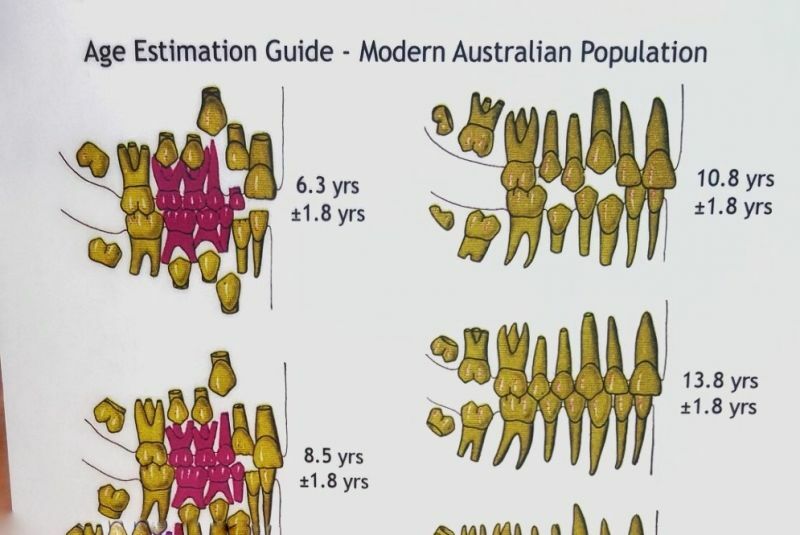 Once he has the records made during life, Brad can begin to compare features such as fillings, crowns, extractions and evidence of past surgery to the dental features seen in the deceased. To confirm identity, Brad must be sure he has an exact match. What is ‘Disaster Victim Identification’? When a major incident or natural disaster occurs that results in multiple deaths, forensic odontologists like Brad might be called upon to help with identifying the deceased. This process is called ‘Disaster Victim Identification’ or DVI, and involves not only forensic odontologists, but also police, pathologists, DNA scientists, finger-print experts, anthropologists, radiologists, counsellors and many other specialists. For small disasters, Queensland has sufficient capability. However, in larger disasters it is usual for jurisdictions to seek help from interstate or overseas. 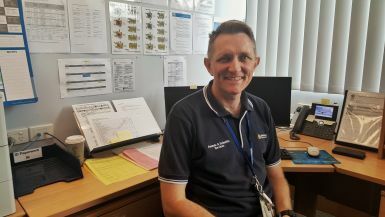 Brad’s colleagues have been involved in many DVI incidents in Queensland and elsewhere, following incidents as diverse as plane crashes, bushfires, tsunamis and terrorism. Incidents requiring DVI vary widely according to the circumstances. 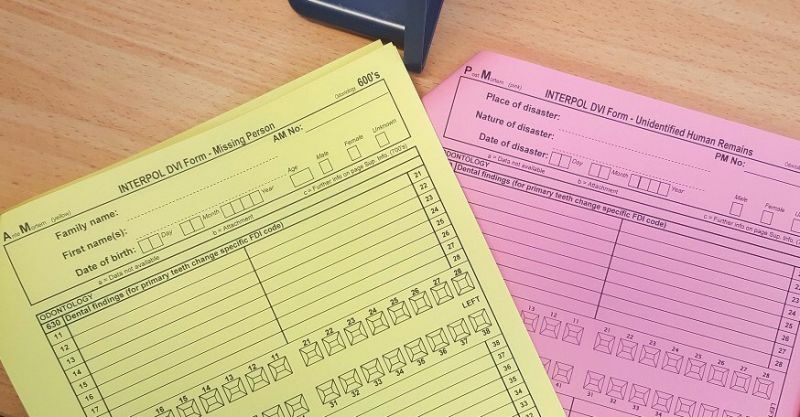 “An event might be a closed disaster, where a list of names of the possible deceased can be given, or open disaster, where there is no definitive list and we may not initially know how many victims are involved,” says Brad. While the day-to-day work of forensic odontologists doesn’t require a large team, when disaster strikes, a larger number of skilled workers is needed. Brad’s team runs DVI training for dentists each year, making sure that if needed, there are enough trained dentists ready with the forensic skills to assist. How to leave work at work? Forensic odontology is not every dentist’s dream speciality, but for Brad, it’s a different way of using his dentistry skills to give back to the community. Still, he makes sure not to let his work affect him. Thanks to Brad and the team at Forensic and Scientific Services for sharing their stories.